The dark side of Uranus imaged by a departing Voyager 2 spacecraft on Feb. 2, 1986 from a distance of 1.189 million kilometers. Like the other giant planets, Uranus has a ring system, a magnetosphere, and numerous moons. The Uranian system has a unique configuration among those of the planets because its axis of rotation is tilted sideways, nearly into the plane of its solar orbit. Its north and south poles, therefore, lie where most other planets have their equators. 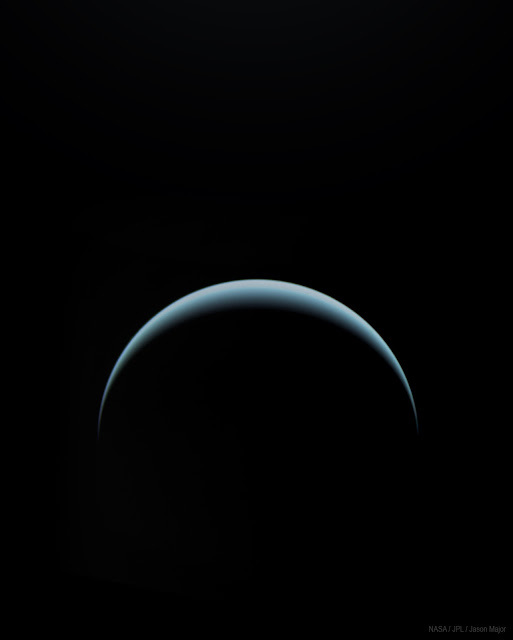 In 1986, images from Voyager 2 showed Uranus as an almost featureless planet in visible light, without the cloud bands or storms associated with the other giant planets. Observations from Earth have shown seasonal change and increased weather activity as Uranus approached its equinox in 2007. Wind speeds can reach 250 meters per second (900 km/h; 560 mph).